Almost every novice at the NLMK plant in Novolipetsk, Russia, is asking one and the same question. Why do they need these huge yellow pipes that run through the entire plant area? In fact, they are fume, gas, and water treatment stations. When NLMK started off with e-Learning, one of the first e-courses was about these pipes. 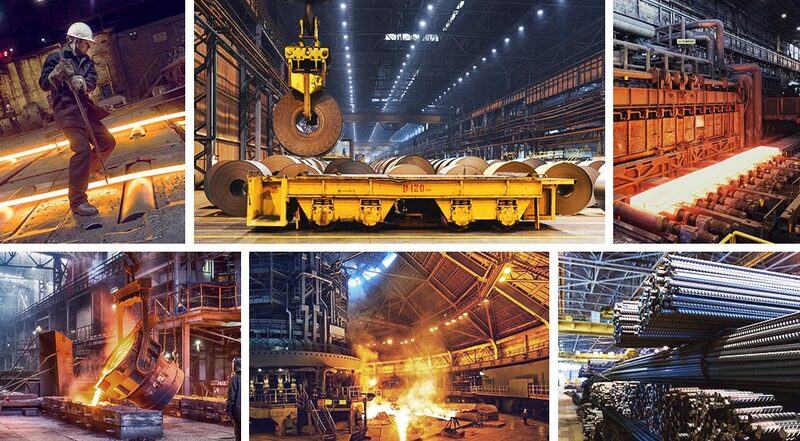 NLMK is Russia’s largest iron and steel company. It produces more than 13 million tons of steel annually, which is almost two thirds of all production in the country. The company has a workforce of 55,000 employees that needs to be constantly trained. The company adopts new technologies and establishes new rules and procedures, and there are some professional competencies which have to be confirmed each year. Mikhail Rusakov, head of the e-Learning department, told us how NLMK began to train steelworkers through interactive games and e-courses. Metallurgy is a high-tech industry. NLMK is constantly developing its IT system to ensure that the production goes smoothly. However, for a long time we were skeptical about e-Learning: we were afraid the quality of training might decline. That was the reason why we trained the staff in person. The first time we put a toe in the online water was in 2011, when we installed the WebTutor LMS and created a library of 27 courses. Part of the content came with the LMS, and the other part was bought for specific projects. The LMS’s interface was as complicated as an airplane’s dashboard, and the courses looked like old books in public libraries – one could open them exclusively on PC through Internet Explorer – so we didn’t use the system much. Quickly inform of any changes in production. In 2016, e-Learning at NLMK was brought back to life. Lipetsk is a small Russian city of about 500 thousand people. Finding a professional e-course developer or LMS administrator there is an impossible mission. We focused on creative and reliable people. We looked for team players who are well-versed in computers, and who know design and multimedia principles. Our plan was to make e-Learning professionals out of them on our own. We posted a vacancy on our corporate portal, in the media, and on the web. As a result, 150 CVs dropped into our inbox. We had telephone interviews with 50 candidates, and then selected 20 with the best potential. Each of them got three test assignments. Three applicants handled it better than all the others. The next stage was a face-to-face interview. After that, there was the next challenge: the e-Learning developer was to create a course, and the LMS admin was to write a script for our LMS. Must-read books. For instance, “Live Learning” by Elena Tikhomirova and “Design for How People Learn” by Julie Dirksen. In total, there are more than 20 books, not all of them about e-Learning. We also read books on HR, sociology, psychology, and other topics that we can use in our work. Webinars. We have a rule: each week, every team member in our department must watch at least one webinar. A notepad for smart thoughts and ideas. Every novice has a notepad where he writes down ideas. Thanks to these notepads, we have created a guide called “How to communicate with learners.” It helps us to have a dialogue with employees who come to us with questions or problems, or just to share their impressions on a course. Smart office parties. We don’t go to bowling alleys or beer pubs. Instead, we prefer to take part in business games and intellectual quests. Shared office. The whole team works in one office. If any idea should appear, we can immediately discuss it and come to an agreement right there. It saves a lot of time. Now, there are four people in our team: two course developers, an LMS admin, and me. After the previous two years, we’ve realized that outsourcing content development didn’t work for us. It’s not a question of money, it’s a question of quality. For example, we could probably trust a freelancer to create a course on time management, as this topic doesn’t require a deep dive into our specifics. But have you ever tried to find an outsourcer who can make a high-quality course on dust and gas collectors? Therefore, we decided to create the content on our own in close cooperation with internal experts at the company. The next step was to find an editor which would allow us to quickly build professional courses in SCORM format. We analyzed both local and foreign-language solutions, and the final choice was iSpring. With iSpring Suite, creating a SCORM course in PowerPoint is child’s play. The process is no different from making a slide presentation. Another advantage of iSpring Suite is its content library. Just like people build machines from our steel, we build e-courses out of iSpring Content Library items. It contains everything we need: characters, backgrounds, icons, and buttons. There are plenty of regulations and information about the manufacturing process at NLMK. Previously, these materials looked like plain presentations. We’ve improved their design, converted them to SCORM, and uploaded them to the LMS. We assign them to the employees, so they can login and study these courses on their own initiative. This content is freely accessible. Such courses are used for self-training. All NLMK employees are required to be regularly certified against the basics of workplace health and safety; otherwise they will not be allowed to conduct shop operations. A year ago, it took a week of in-class training to prepare for a test. Now, the training is digitized: our employees sign up to the LMS, study the course, take the exam in a computer class, and get clearance. There’s no need to spend a week in class – they learn when it’s convenient. Thus, employees save their learning time by 50%. These materials cover corporate culture, soft skills, and personal performance. In addition to the theory, there are many practical exercises in the courses: tests and dialogue simulations. It is important that the employees don’t simply read something – they should retain the knowledge in their brains. For instance, let’s take a course on conflicts of interest. When developing it, we used real cases from our experience as examples. Thanks to this, it easily makes clear what a conflict of interest is, and why it’s dangerous for an employee and the company. The foundation of this content type is good storytelling and gamification. It’s important to come up with a plot, a conflict, a time of action, and a main character, then work on design and practical exercises. For example, let’s take our course “Gas treatment stations and water purifying units.” The key idea: All NLMK plants use gas treatment stations and water purifying units. They serve as a filter and prevent harmful substances from entering the atmosphere. However, some new employees don’t know what the units are for, or how to figure out whether they are in working order or not. The course consists of eight 20-minute modules. It has a branched scenario which unfolds in various locations – all of these are made according to the storytelling principles outlined above. The learner can select an instructor who will guide him through the learning. These instructors are real people working at NLMK. In the best traditions of computer quests, the user always has a choice: follow the right path or close his eyes to the problem. Every decision has its consequences. This is one of our first courses. It took four months to develop and approve it. We get content requests from operations personnel. If they need learning materials on a specific topic, they email me, and we add it to our to-do list. With iSpring, we created a talent pipeline training program that we use to develop high-potential employees for the position of foreman. Face-to-face training. The learner studies up on the key efficiency indicators and, even more important, how he or she influences them. Duration: 2 days. Online learning. The learner studies courses on the NLMK Group facilities, the production process flow, our clients, the internal business processes, and key regulations. Duration: 1 month. Blended learning. A mix of online courses and in-class trainings on soft skills. At this stage, we turn yesterday’s frontline worker into a qualified manager. Basic competencies are studied online, and then they are put into practice in face-to-face trainings. Specially for this program, we developed 21 courses on the technological chain of metallurgical production, labor management, maintenance and repair of the equipment, and so on. 15 people have already completed this training and received certificates of professional development. To grow interest in e-Learning, we’ve launched an internal PR campaign. One of the most popular features is quiz competitions with Anatoly Lasserman twice a month. This character is based on Anatoly Wasserman, who is famous for his multiple wins on quiz shows in Russia. The difficulty is that Lasserman is a recognized expert in all possible fields of knowledge and never mistakes. We select from 6 to 10 questions on a topic relevant for the company at the moment, and then create a dialogue simulation with iSpring Suite. The idea is to get as many points as possible. The project has been working only three months by now. During this time, more than 300 people tried to beat Lasserman. The game helps to engage employees in learning as well as conveys a lot of new info. You can enter the battle from a computer, a tablet or a smartphone. We’ve also created a website specially for e-Learning; it’s a part of our SharePoint-based corporate portal. There is a list of e-courses with brief descriptions: what a course is about, and who it will be useful for. We also publish news about corporate training there. Every month we choose the most active e-learner and grant him access to Eduson.tv, the Russian online corporate training service. Once a week we send employees an email with the users’ rankings, so people can see their position among all the employees of the company. The staff appreciated the approach: they’re able to control the pace of learning and are less distracted from work, as they can level up skills and knowledge in their spare time. We’ve transferred 20% of our live lectures into online format, so we save money on the business coaching services we previously had to hire. Another benefit: in the past, different groups of learners had different trainers, and each trainer had his own approach. E-Learning has corrected the imbalance, as now we are training everyone according to a single program.